This Sunday afternoon, I finally made fresh ricotta cheese, but this post is not about that :o) You can read about how to make your own ricotta on Eggs on Sunday blog. After tasting this creamy and very light just made ricotta, I was inspired to make something even better with it. I had a couple of the season's first peaches so I put them to work. Caramelized peaches became very soft and velvety with a subtle taste of cinnamon and clove. Even though they were still a bit sour, it gave a nice contrast to sweet honey and pepper sauce. Honestly, I was not so sure about adding pepper initially. I mean, the rest of the dish was so delicate and mild, I was worried that fresh pepper taste might be too strong for it. But once I tried it, I added more pepper - it was an excellent touch! 1. Preheat the oven to 220-230 C degrees. Halve the peaches and remove pits. 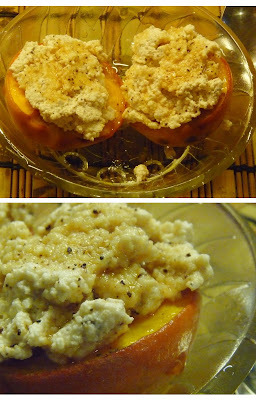 Pierce the peaches with 2 cloves and a small piece of cinnamon each. Put a little bit of butter and a teaspoon of brown sugar on each half and bake them in the preheated oven for 5-8 minutes or until the peaches are soft. The time will depend on how ripe the peaches are. 2. After the peaches are done, carefully remove the cloves and cinnamon sticks using a fork. 3. Add about a half of teaspoon of cinnamon powder to ricotta and mix it well. Top each half with a heaped tablespoon of ricotta, drizzle with honey and sprinkle with freshly crushed pepper. Serve it warm. You can also make this with pears or apples.